alone together is to be performed for a second run. Michael Ball is appearing at the Theatre Royal, Haymarket, London, as part of the Singular Sensations season, performing every evening (excluding Sunday) at 7.45 pm between Monday 27 September and Saturday 9 October. You can book by telephoning the Theatre Royal Haymarket Box Office on 0870 901 3356. Tickets are priced at £25 plus £2.50 booking fee. Or book online at Ticketmaster. If you saw the show at the Donmar Warehouse, you will want to see it again. If you missed it first time around, you don't want to miss it now! Michael Ball appeared at London's prestigious Donmar Warehouse for a two-week run (Monday 17 - Saturday 29 September, 2001) as part of the annual Divas at the Donmar season. The specially-devised show (directed by Jonathan Butterell) offered Michael the opportunity to create and perform a unique theatrical event, consisting solely of songs and part-songs that he had never before recorded or performed in public, all chosen, edited and reinterpreted to tell a story of a musical actor who lives to perform, but suffers off-stage. His successful career is contrasted with the feeling of emptiness once the applause is over; the adulation of the crowd with a problematic personal life. The image of the performer is at odds with his own experience. Together, the sixty songs display Michael's vocal and acting talents to the utmost, showing his amazing vocal range in work which goes back to the nineteenth-century, with a George M Cohan number and comes right up-to-date with Radiohead; from big musical numbers to quietly intimate pieces, all sung just to the accompaniment of a piano, played by musical director, Jason Carr. 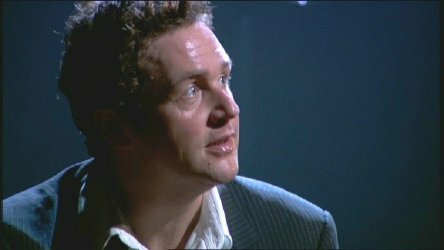 Accustomed to large concert halls and the backing of orchestras, the intimate space of the Donmar Warehouse (with an audience of just 250) allowed Michael to sing sotto voce, in songs such as Solitude and How Can I Lose You, with no hand mike, and still be heard clearly in all corners of the theatre. For other songs he used his full power, the contrasting vocal styles adding to the drama and emotion of the show. The generic nature of the story and the breadth and depth of the material has resulted in a show which means different things to different people, and this is reflected in the reviews of the critics and reaction of theatregoers. Talking to friends who were also lucky enough to see the show, it is clear that many of us have come to different conclusions, and that these conclusions alter as we further discuss what we saw and heard. In interviews held before the show was first performed, Michael said he hoped the audience would be made to think. He certainly achieved that! Both deeply moved and inspired by alone together we have continued to discuss the show long after we met at the Donmar, and have decided to create this website as a tribute and a thank you to Michael Ball for an amazing performance. out the Links page for more details.